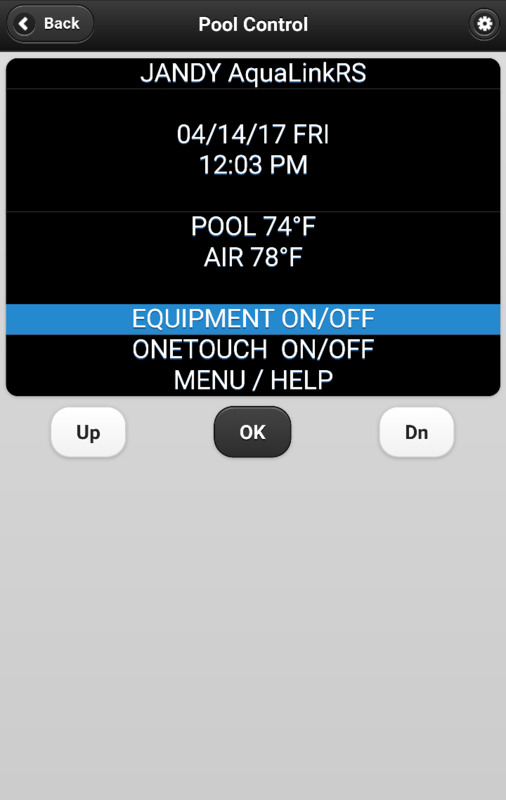 I recently purchased a house, built in about 2006, that has a pool controlled by a Jandy Aqualink RS with a PDA. Yesterday the Aqualink was malfunctioning and so I turned to the internet for advice in resetting etc, and now it seems to be working correctly again. However almost everywhere I read, it sounds like I should have an internal control panel somewhere. I haven't been able to find any separate internal control panel, just the power center with the pool equipment and the little handheld PDA. Is it possible I don't have a separate internal control panel, or is it just hidden away somewhere? I tried googling for an answer but I keep just coming up with information on the panels, not whether it is possible that I don't have one. The buss highlighted in yellow is where remotes to the system connect. your PDA transmitter connects there, and if you have a chlorine generator, it would also connect here. Those two would have a wire that runs directly to the corresponding component. If you had an indoor remote, you would have a wire connected to that buss, then the wire, if you followed it, would disappear into a conduit. A spa side remote would use a different buss, the one with more than four wires, right next door to it. 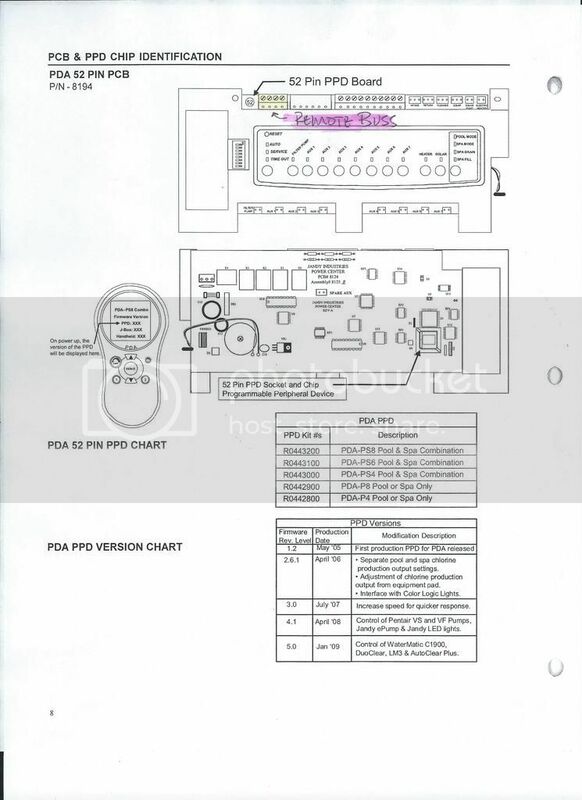 You don't need a internal control panel if you have a PDA. My system doesn't have one. I'll add to gwegan's response..
You don't need the panel, the PDA takes it's place but you can / should look into getting an Autelis so you can break away from that clunky old PDA and control your pool with your smartphone or computer anyplace you have an internet connection for much cheaper (and better) than the Zodiac/Jandy solution. The one I linked is probably the best one for you but if you post in their forum they will get you hooked up with the right one. I must add that you either need wired Ethernet nearby or use a WiFi Bridge like depicted below. Thanks for the suggestions. I will check that bus for a wire when I get home. I will also definitely look into the Autelis too, my PDA is very old and worn and would probably need replacing sometime anyway and the Autelis looks like it is actually cheaper. Is installing/configuring the Autelis fairly easy for a novice like me, or would I need to get it professionally installed? I can handle simple router configuration etc, but I don't have much experience beyond that. I installed mine as you see but I'm pretty good with networking stuff. It connects directly to the 4-wire RS-485 bus in the diagram above and then to your local network at your house. You then just log into it's webpage to control your pool with it. I have it talking to my home automation system and do a lot with it. The other two black boxes and power supplies you see are to control my variable speed pump. with my home automation system. Autelis is pretty good about helping set it up through their forum support. If you can connect your phone to your home WiFi you can connect a bridge too as they are pretty self explanatory now with walk through instructions basically now. Some of them just connect through the WPS button on your Router too now. You then plug the ethernet cable from the bridge into the Autelis with the autelis connected to the Jandy board as described above. The Autelis recognizes your system and lets you connect to it. It even has a web app for your phone. This is $300. A PDA is more. A new Jandy Aqualink compatible with the iAqualink and then buying the iAqualink itself is a LOT MORE AND you can only connect to your system through THEIR website. This keeps is all under your control. Here's a screen shot of it on my phone. It replicates the wired indoor panel. I'm 60 miles from home right now.